I’ve seen lots of plays lately, as usual, and wanted to give you a little recap of a few to see, or not. Seanachai does an excellent job with this terrific Irish script by Billy Roche. It’s a tough story about a traveling roadshow that includes a fake bearded lady, carnival booths and fake boxing ring challenges. Every day is the same; only the towns change. The main story thread is about Dean, a boxer who can’t seem to win, and Junior, a once-champion who was forced to retire because of an injury. The bullying roadshow owner Theo and the cut man and boxers’ mentor Peadar are the other two male characters. Two women create really strong performances to anchor the play. The boxing ring set is handled with great care and almost seems to create a play within a play. My Gapers Block colleague, Alice Singleton, reviewed it and adds some interesting insights. 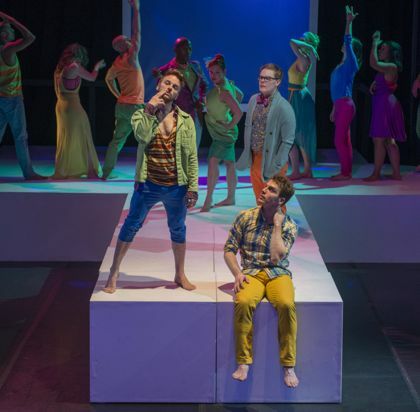 Lay Me Down Softly runs until May 25 at the Den Theatre, 1333 N Milwaukee Ave. Like Seanachai’s recent production of The Seafarer, which I reviewed in December, it’s a must-see. Oh, how I love those Irish playwrights. Dorian runs until May 18 at the Chopin Theatre on Milwaukee Avenue. My review here. This play has received excellent reviews, every one of them richly deserved. 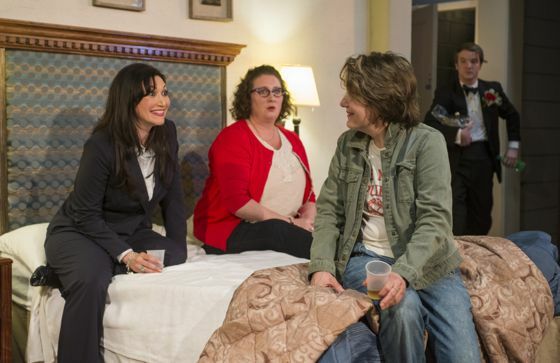 It’s smart and well written, warmly acted by a fine cast, and directed by Jeremy Wechsler. The script is by Madeleine George, a writer with Massachusetts and Brooklyn connections. It’s about relationships between friends and lovers and the financially stressed closing of the museum at a small northeastern college, which will leave the mammoths homeless. Every cast member is excellent. The day I saw it, one of the major roles was played by a superb substitute, Penelope Walker. Laura Fisher, an old friend from Famous Door Theatre days, is outstanding in one of the other lead roles. A special treat is the performance by Steve Herson, who plays various characters including the museum caretaker, a reporter, citizens at a town hall meeting, and a board member reading the hilarious minutes of the meeting. In each case, his accent is different and perfect. Also the museum exhibits include prehistoric people in diorama exhibits who voice the concerns of museum visitors. Seven Homeless Mammoths is a great treat and you shouldn’t miss it. It runs until May 17 at Theater Wit on Belmont. 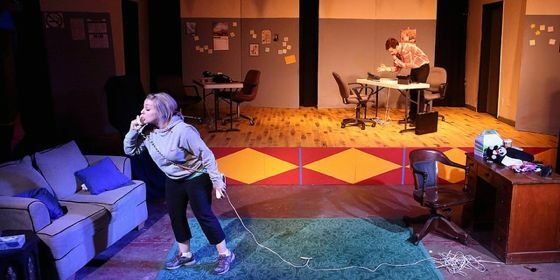 “Loneliness, regrets, friendship, humor, and a little maternal instinct season A Red Orchid Theatre’s new play, Mud Blue Sky. Director Shade Murray gets the most out of Marisa Wegrzyn’s fine script, which revolves around airport life. The tiny Red Orchid space on Wells Street is perfect for the claustrophobic story of three very mature flight attendant friends on a layover at a hotel near O’Hare.” Beth and Sam are still flying. Angie lost her job recently and now lives in a Chicago suburb. Angie misses flying and the others can’t wait to get away from it. That’s the story until they get acquainted with a young man named Jonathan, who helps them find some relaxation and entertainment. My review is highly recommended at theatreinchicago.com. Mud Blue Sky has been playing to sold-out houses and it’s now extended until June 29. Our Class by Tadeusz Slobodzianek is a play about the Holocaust—set in the small Polish town of Jedwabne in the years leading up to World War II. The play was troubling and thought-provoking and my friends debated and disagreed about it afterwards. The story begins in the schoolroom where members of “our class” study and play together. They are all friends, whether Jewish or gentile. Hints of anti-Semitism creep in to their school and their play from time to time and gradually increase. The key event is the 1941 massacre of virtually all the Jewish citizens—1,600 men, women and children–by their neighbors. The perpetrators are never accused, never held accountable. In the years that follow, various survivors lie about their role in the event, including one who hid and one who had converted to Christianity. Despite the power of the first act, most of the second act is bogged down in excessive exposition. Too much detail kills the power of the first act. The play runs nearly three hours, with one intermission. This is a risky sort of play for Remy Bumppo, which tends to produce superb quality Anglophile theater by great writers. Their regular ensemble is made up of talented and experienced Chicago actors. Our Class takes Remy Bumppo in a totally different, riskier direction and brings in some younger actors new to the company. Reviews are virtually all “highly recommended” or four star. Our Class runs until May 11 at the Greenhouse Theatre Center. Photo by John C Oster. Three short plays by three brilliant writers: David Mamet, Elaine May and Woody Allen. Unfortunately, they were all writing on their off days because the scripts in Death Defying Acts aren’t very good. The production is medium, with a few good performances. I really wanted to give this play a better review but I just couldn’t. The theater company decided to create a circusy atmosphere in the lobby and around the production, which was not a great idea. Here’s what I said about that in my Gapers Block review. Death Defying Acts runs until May 18 at St Bonaventure Church, 1641 W Diversey. The theater space is in the basement; entry door on the west side of the church. Good news is that there’s free parking in the church lot. The Wind Rises returns. This wonderful Japanese animated film by the master filmmaker Hayao Miyazaki is scheduled for a two-week run at the Gene Siskel Center, May 16-29. I wrote about this film when it opened recently. It’s beautiful, hand-drawn throughout, rich and complex in its use of Japanese history and mythology. If you didn’t see it before, you have another chance. Photo courtesy Siskel Film Center. Othello at Siskel. 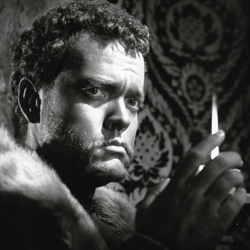 The great and greatly flawed Orson Welles 1952 production of Shakespeare’s Othello has been running at the Gene Siskel Film Center. I saw it for the third time last night (the first time was when I was in college at the old Fine Arts cinema, the second a few years ago at the Music Box). The 1992 restoration made a lot of improvements in visual and sound quality. It’s a powerful film, with Welles starring as the Moor. It’s clear why his film presence was so huge; he dominates every scene with his size, voice and expression. The play is really Iago’s, as Harold Bloom insists in his essay on Othello in his book, Shakespeare: Invention of the Human. The actor who plays Iago in the film (Micheal Mac Liammoir, an Irish actor who founded the Gate Theatre),does a creditable job but can’t stand up to the Welles persona. Because he is Orson Welles, no matter what role he is playing.